On behalf of Admin of JML Law, A Professional Law Corporation posted in Wrongful Termination on Wednesday, Apr 04 2018. If you have suffered an injury – in the workplace or outside of work – and were unable to work due to that injury or some other medical condition, and then you were fired, it may be worth investigating whether or not your firing amounts to wrongful termination. Our Riverside wrongful termination attorney at the JML Law explains that getting fired while on disability or medical leave is not uncommon in California, where the vast majority of workers are employed on an at-will basis. In some cases, these firings amount to wrongful termination. But in other cases, just because your employment has been terminated on disability leave does not automatically entitle you to slap your employer with a wrongful termination lawsuit. That is because if you are an at-will employee, your employment can be terminated at any given time, and for any reason or no reason at all. Unless, of course, you were discriminated against on the basis of your disability and medical condition. In that case, you might be entitled to compensation under California’s wrongful termination laws. Was your firing on disability leave illegal or not? In Riverside and all across California, it is illegal to fire an employee while he or she is on disability or medical leave in limited circumstances such as when your employment is protected by a labor union agreement or you are employed at a public agency. In all other cases, however, your employer can choose to fire you even while you are on disability leave, and you might have to pack your things, being unable to do anything about it – unless, of course, you were fired because of your disability or medical condition, which would amount to discrimination and, in turn, a wrongful termination case. 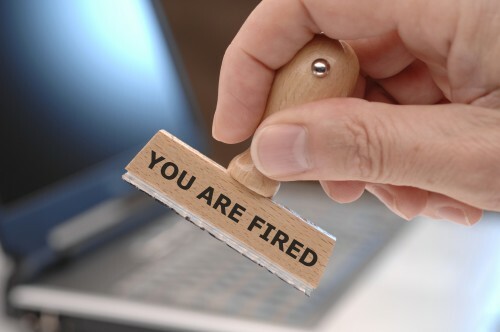 Our Riverside wrongful termination lawyer explains that in order to determine whether or not your firing was illegal, your attorney will have to examine the specific circumstances of both (1) your employment and (2) your termination. In other words, if your employment was terminated for a legitimate reason – and that reason was not your disability or disability leave – you cannot do much from a legal standpoint. However, if your wrongful termination attorney can prove that there was no legitimate reason to fire you or that the reason given (poor performance, not being a good team player, etc.) was just a pretext to fire you, you may be able to sue your employer. Let’s review these two examples to give you a better understanding of what does and does not constitute wrongful termination when it comes to getting fired on disability leave. Example #1. Let’s say you are one of the employees fired as part of the employer’s workforce cuts. Some of the terminated workers were on their disability leave just like you, others, however, were actively working prior to the firing. If there is a legitimate business reason – reorganization, financial considerations, unsatisfactory performance, misconduct, or other legitimate reasons – behind the firing, you will most likely not be able to sue the employer. However, it is always a good idea to let a Riverside wrongful termination attorney review your case to determine whether or not your firing was illegal. Example #2. Let’s say you have just returned from your disability leave and were immediately given a negative performance review even though you performed your job just as efficient as you did before your disability leave. Or let’s say you are being falsely accused of misconduct by your employer. Or let’s say your employer unambiguously expresses his/her discontent with the fact that you are or were on disability leave, or even does not believe that your injuries were bad enough to go on leave. Keeping all that mind, you are being terminated for any subjective reason, be it poor performance or anything like that. In that case, your firing was most likely illegal, and your wrongful termination lawyer will be able to prove it. Seek legal help from our skilled attorneys at the JML Law. Get a free consultation about your particular case by calling our offices at 818-610-8800 or send us an email.